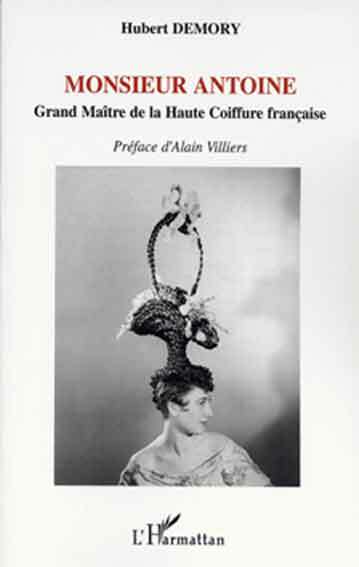 Ce livre raconte la vie d'Antoine Cierplikowski (1884 - 1976), appelé "Antoine de Paris", qui fut le premier à sculpter les cheveux des dames et dont l'excentricité et le talent font penser à Salvador Dali. Sa main droite repose dans le cimetière de Passy. Né et mort en Pologne, il habita pendant plus de 45 ans dans le 16° arrondissement de Paris. C'est lui qui a formé Alexandre de Paris, qui fut longtemps son premier garçon et rapporta la main droite d'Antoine à Passy..
248 pages dont 118 pages d'illustrations et un résumé de 13 pages en anglais. Monsieur Antoine was a very famous hairdresser, well known troughout the world. This book includes a summary in English ( 13 pages) and includes 118 pictures. To order, see below. Antoni Cierplikowski is born on December 24th 1884 at ten o'clock in the morning in Sieradz, Poland. His nickname in Poland was Antec, but in France he will be called "Monsieur Antoine". In December 1901 he travels to Paris and works for Decoux, a hairdresser and postiches-maker. On January 24th 1909, he is in London and marries a French girl : Berthe Astier, just before they have a son who dies few days later. By end 1909 they are back to Paris. In 1912, he opens his famous "salon Antoine" in rue Cambon, number 5. In 1913 he meets Xavier Dunikowski who remains his best friend. Then he opens saloons in Cannes and Marseilles, and a factory for "Produits de Beauté Antoine". In 1925, he is called to open Antoine saloons in the United States, by the end of 1945 there are 121 Antoine's saloons in the States and 3 in Canada plus one in Australia. In 1963, thanks to Antoine, Jean Guillou, who is to-day one of the most famous organist in the world, is hired as the titular organist of the church Saint-Eustache which has one of the finest organs of Paris. By end of 1970, Antoine returns in Sieradz (Poland) where he dies on July 5th 1976 and is burried in the Sieradz cimetery. In June 1992, his right hand is deposited in a grave Antoine has prepared for himself in the Passy cimetery (Paris).